I have been getting some questions lately from various readers asking for more details on how to convert curricula to fit a child who does not write or speak. The adaptations are easy to do. They do require time however. I use various resources for his curricula. Currently, he is doing preschool level, but I am preparing the Kindergarten curricula to fit his skill level this autumn. He will need to do the curricula 2-3 times total before he will be ready to move forward to 1st grade. In autumn, he will be old enough to do Pre-K, so that will be the first time through the Kindergarten level. His main curriculum will be the My Father’s World Kindergarten program. I have been finding in used book stores some Pre-K and Kindergarten level teacher resource materials also. These are books or magazines that a teacher uses to make photocopies of the activity pages for the class. One such book is “My Body” by Brighter Vision Learning Adventures, which is written for 3-5 year old children. When I get worksheets for Pookie, I have them laminated. We are blessed to have access to a very low-cost large laminator at a Christian book store that sells curriculum and teaching supplies. I am able to heat laminate at a cost of 25 cents per foot. I take all the worksheets needed for a semester at a time and laminate them all at once. The laminating of the worksheets allows me to use the pages numerous times to insure that Pookie is learning the information. Some worksheets may need a small amount of adapting prior to lamination. One example is a cut & paste worksheet where the child is to cut out the words to be pasted under their corresponding picture. I cut apart the worksheet and trim the main portion (with pictures to be labeled) so that I can use spray adhesive or rubber cement to adhere it to a sheet of cardstock. I leave enough room on the bottom of the page blank to add the words after lamination. Once I have the main portion on a backing sheet of cardstock, I laminate both portions. The word labels are cut out and then Velcro dots are added to use in placing the words under their pictures. The Velcro is not critical, but it serves a purpose. Children sensory disorders can become easily frustrated if the word labels shift around after being placed under the pictures. To avoid this, Velcro dots are used. A secondary reason for the Velcro is to make it easier for the parent/teacher. If the child has a “completed work” bin that they put their work into, the word labels have to stay in place even after being placed in the bin. Yes, I could check his work after each assignment, but eventually I am expecting him to be learning more independently. Many worksheets can be turned into file folder games. One such worksheet is one that requires the child to sort items by category. On a sheet of paper, make a column for each category. Adhere the page to the inside of a file folder. On the opposite page of the folder, adhere a pocket or envelope. You can decorate the outside front of the file folder is desired. Label it with the worksheet title and any special instructions. Laminate the opened file folder and the worksheet containing the pictures to be sorted. Carefully cut a slit through the pocket/envelope inside the file folder so that it can be opened. Cut out the pictures and place these “game pieces” into the pocket/envelope for storage. As with the above example, you can add Velcro dots to the game pieces to hold the pieces in place until you are able to check the child’s work. Any worksheet that requires a child to write in their answer or to otherwise mark off an answer can be laminated. In many phonics workbooks, you can find a series of pictures on a page. The instructions may say to mark off any picture that does not begin with a specific letter sound. These worksheets, once laminated, can be used with a dry erase marker. To avoid the frustration of a child accidentally wiping off their work, I would strongly suggest using the Vis-a-Vis markers that are made for writing on overhead transparencies. They work like a dry erase marker, but need a damp cloth to clean the markings off of the page. There is a cute puzzle worksheet in the “My Body” workbook that I mentioned above. It is a very simple one with a picture cut into 4 rectangles to make the 4 puzzle pieces. Next to the mixed up pieces (which the child is to cut out) is the base that the child glues the pieces onto. This puzzle is a great one for laminating. Velcro dots on the back of the puzzles pieces to adhere them to the base makes it a bit easier for the child to complete the puzzle. With very young or a child with delays, you can simply remove only a couple of the pieces. Once the child is successful in finishing the picture with just a couple of pieces removed, you can increase the difficulty by removing more pieces at a time. To make this activity, I carefully cut out the puzzle and put it together. I used a small piece of tape on the back to hold the puzzle pieces together. I color copied the completed puzzle. This gave me a picture for Pookie to be able to refer to when needed to aid him in completing the puzzle. The puzzle base and pieces were then laminated. You could make this a file folder activity by adhering the puzzle base to the inside of a file folder prior to lamination. I chose to leave this out of a file folder. I adhered the color copy of the finished puzzle to the outside of a 6″x 9″ envelope. I laminated the envelope along with the puzzle base and pieces. Velcro dots were added to the puzzle pieces & base. I cut a slit through the lamination where the envelope pocket was sealed shut. The puzzle base and pieces are stored in the envelope. I added a Velcro dot to the envelope flap to make a closure for it. NOTE: you can make these puzzles yourself from any picture. I like the 5″x 7″ size or larger. Cut the rectangles parallel to the long side of the picture after laminating. Another fun and very beginner level puzzle that you can make is to use a circle punch or a circle cutter. Laminate an 8″x 10″ picture. Randomly cut out a few circles from the picture, leaving most of the picture intact. The size of the circle cut out really depends upon the ability level for your child. Worksheets that give practice in sequencing are very easy to convert. One worksheet that comes to mind is one that requires a child to color the shapes in a specific sequence, then to finish coloring the remaining shapes to repeat the sequence. I used this as an “inspiration” for making my own version. Using some stickers of the same theme (the inspiration was an autumn unit study), I made a sequencing worksheet using stickers of 2-3 different types of autumn leaves. The worksheet had a grid on it that gave 1 space per sticker. The last 2 spaces of each row was left empty. Next, I placed the stickers needed to complete the worksheet onto a scrap of cardstock. The worksheet and sequencing pieces are then laminated. I cut out the stickers using a circle punch. On the back of each sticker piece, I used a Velcro dot to adhere it in place on the worksheet. You can make these with any theme. For writing practice, I use a traceable font in the size print needed to match to my son’s abilities. All copywork is printed out on cardstock before laminating. The Vis-a-Vis pen is all that is needed to complete these. One note that I would like to make about why I use so much lamination. I know that Pookie will be using these pages a long time. Once laminated, I don’t have to worry about the pages tearing. You could put worksheets that require writing into sheet protectors, but the sheet protector will slip around unless the pages are backed with cardstock. We have used the sheet protectors with Little Miss when I made her morning calendar notebook. After using the sheet protectors for a while, I printed out the pages cardstock and laminated them. It is much better for her now. Seeing her frustration with slipping sheet protectors, I knew that Pookie would definitely have problems with them. The laminating was a much better fit for both kids. I hope that this explains better what I am doing for Pookie. Feel free to contact me if there are questions. We have been eating a mostly vegetarian diet for some time now. Pookie has never really eaten meat without it being well hidden in foods. One of the areas that I have to be watchful of is that we get enough proteins in our diet. We eat a variety of foods that contain protein, one of our favorite being quinoa. We use that as much (if not more) than we used to use rice. Problem is, sometimes Pookie just gets in a mood where getting him to eat enough is a challenge. Sensory issues abound on those days. Foods that he normally will eat well, just don’t appeal to him. I have found a great way to get proteins into him though. I cannot remember where I found the recipe online, but it has been a blessing to have. I keep the ingredients around and make it often. I warm up the honey and peanut butter just enough to make them more pourable. Stir in the vanilla and protein powder. Pour over the cereal in a bowl. Mix together to coat the cereal well. Spray a 9×9 inch pan with vegetable spray. Spoon the cereal mixture into the pan and press evenly into the pan. Let set until cooled completely. Cut into bars about 1×3 inch in size. The bar size may seem small, but these are very filling! * I have used various cereals in place of the rice crispies type. The kids love them made with Kix or Cheerios cereals. You could try the recipe with granola (my favorite way to make them) or any cereal that is not overly sugared. Even on days when Pookie is the most picky about what he wants to eat, these are always a hit with him. I love that the kids think they are getting a snack, but it is a very healthy one. I have been looking at this past school year and am seeing a need to make slight changes. The curriculum is great and working out so well that there is no issue there. The issue is in getting our family back on a set routine. Pookie wanders around looking “lost” unless he is actively doing something. Yes, he has free play time, but he doesn’t function well without structure. I am seeing a need for the same structure in Little Miss. She does great when there is a set routine in place. She does not get near as much done without that routine. With that in mind, I have been working on getting us on a schedule that will allow us the time we need for getting schoolwork completed as well as having plenty of time for the kids to play. I am blessed to have kids who like to get up very early. Those who know me best are well aware that I am NOT a morning person, so the word “blessed” is said tongue in cheek. LOL Unfortunately for me, both kids take after their Daddy in that they wake up early and are very “perky” as soon as their feet hit the floor. This means, Momma is waking up a half hour or so earlier than they do so I have time for a cup (or 2 or 3) of coffee before I have the “invasion of the little people” commences. Over the past school year, our schedule went out the window. Honestly, I am not sure how we managed to get as much done as we did. We had 2 families living under 1 roof for a period of 7 months. In a situation like that, when both families have their own way of doing things, it is very difficult to maintain a set routine. Little by little, ours went by the wayside. Now that we are back to only 1 family in our home, I am seeing just how far from routine we had become. The effect has be quite definite in the kids. I used to have a weekly schedule that helped me to space out the bigger tasks that had to be done each week. Living off-grid, my daily chores are done without the benefit of electric appliances. This includes laundry, which I wash by hand on a scrub board to then be hung out on a clothesline. The only exception being during the rainy season or winter when I will make trips to town to use a laundromat so that I can use the dryers. With this lifestyle, a schedule is essential for me to stay on task as well as the kids! I am reestablishing the routine that I had before, but with a few minor changes. Pookie no longer takes naps on a daily basis and there is his therapies to factor in. I am now getting up early enough in the morning to have breakfast ready before the kids wake up. As soon as breakfast is done, homeschooling is begun. We start out with Little Miss doing her morning calendar notebook while Pookie plays for a few minutes and I wash the breakfast dishes. Next, we work on the group activities that both Little Miss and Pookie can do together. This includes the daily devotional that corresponds with day’s lesson and finding Daddy on the map. If he is in a state that we have not studied yet, then I may make it the state of the week to focus on. Once the group activities are done, we go on to the individual tasks. Individual tasks are where we are doing the workboxes. Worksheets from Little Miss’ curriculum are placed into the workboxes as well as supplemental materials. She is continuing in her Rod & Staff Mathematics. She also has geography workbooks, a lapbook, and her Little Keeper’s program activities. These assignments are mostly done independently with only minor guidance from me. While Little Miss works on her workboxes, Pookie is doing his. I work one-on-one with him at this point. He is still learning how to use the TEACCH program’s way of doing his preschooling. I reread the book by Sue Patrick with a fresh outlook and am seeing the wisdom in why she organized the system as she did. While Little Miss may do well with slightly less structure or without the bins that Ms Patrick recommended, Pookie needs the increased structure. He needs to bins without a lid on them, yet they need to be deeper than a tray. I found that the clear box-like acrylic photo frames make a good rigid tray. I am not needing a lot of workbox containers at this time, so am buying them just a few at a time. I am getting the clear flat containers that are large enough to hold a workbook, yet only 3 inches tall. They have a flat lid that is clipped into place. These will work for both of the kids. If Pookie is doing an activity that requires more depth to the container, it would only require that I not put on the lid. I do like the uniform appearance of the kids having the same type of bins. The greatest advantage to these style bins is that they take up far less space on shelves than the shoe boxes Ms Patrick recommends. By autumn, we will be fully ready to the new school year with the workboxes back in place and organized much better. Little Miss is happy to be getting them back. She missed using them. It gave her a sense of accomplishment to go through the boxes independently and watch as the shelves emptied out as the morning went along. With the reestablishment of the workboxes comes the visual schedules. Of the entire workbox system, this is both my favorite part, yet my biggest challenge. Little Miss is really easy to please when it comes to the workbox tags. Doesn’t matter if it is simply the numbers on pretty paper or a themed set of tags. She loves them. Pookie on the other hand is more of a challenge. While I plan to simply use clip art that represents a specific school subject for his workboxes, I am also including clip art for the various therapy activities, such as sensory bins, fine motor, and gross motor skills. It is taking longer to get it all set up than I wanted, but I am seeing the light at the end of the tunnel. In 2 weeks, the library that we go to is having their Summer Reading Program kick-off. Little Miss is thoroughly excited about it. We participate each year. It is a fun time. We spend many hours a week simply enjoying books. We read a lot of books throughout the year because of homeschooling year-round. During the summer reading program, we do not count the school related reading. Any books read during free time are logged for the program however. One of Little Miss’ favorite places to go is a plaza in Oklahoma City. There is a 1/2 Price Books store. a craft supply store, and a Christian Book store all in the same plaza. At 1/2 Price Books, she always picks out a couple of books to buy. Past books that she chose were Little House series books and Charlotte’s Web. Next, we go to the craft store to pick up a project for her to work on. Since we only go to the stores about once a month, we get something that will keep her entertained and busy for as long as possible. Last time there, we bought the supplies to make a craft that she heard about in one of the Little House books. At the Christian book store, we buy some school supplies. They have a wonderful children’s section there also where we always find a book or two that the kids will enjoy. On average, I am reading to the kids about 3 hours per day, not including any books read to them in relation to their schoolwork. Little Miss is beginning to read a bit more on her own also. We don’t have a TV or video games to distract us. Books are one of our primary forms of entertainment. Taking part in a summer reading program just adds a bit more to it. For those wanting more activities to do in conjunction with reading, you can find many free lapbooks available to go along with individual story books at Homeschool Share. The lapbooks are fun to put together. One series of lapbooks they have is for the Little House books. The Mom who designed these did them for her own daughter. The activities pages and ideas are a great extension to the books that will enhance them greatly. When reading the book, “Little House in the Big Woods,” she was able to recreate many of the projects the book mentioned. Making butter using heavy cream was one that she loved doing. She helped me make bread that day and as the bread was baking, we made the butter. By the time the bread was done baking, we had fresh butter ready to spread onto the warm slices of bread. Little Miss enjoyed it so much that we are doing that lapbook again. This time around, we will also be making cheese like Ma did in the story. Little Miss has made a corn husk doll, sewn a “pocket” by hand, and made fleece scarves. All were inspired by the Little House story lapbook. Whether you homeschool in the summer or not, taking part in a summer reading program will benefit your children. Adding a lapbook or another such activity to enhance the stories read will give them more dimension and meaning. It will also allow children to continue learning even while on their summer break. It didn’t take long in preschooling my son at home to realize the important role purposeful play can be in helping him to learn. I define purposeful play as any game or toy that can be used to teach or reinforce a specific, desired skill or idea. In using the TEACCH approach at home, I am quickly finding ways to help Pookie to develop skills while doing simple tasks in an organized fashion. One of his weak areas of development has always been the fine motor skills. With that in mind, I often focus many of his tasks around that one developmental area. Certain skills are more easily mastered than others. Teaching him to use an incentive chart is one of them. He picked the incentive, which happened to be a fruit breakfast bar, which are a favorite snack of his. Having to place sorting bears into a dish, one at a time, to earn his tokens was worth it to him. I had his breakfast bar where he could see it and he quickly got the idea of what I wanted him to do. After a few times, he now will start doing the activity without prompting. Pookie loves cars. I have begun using them as a teaching tool. I have the alphabet letters in large “bubble letter” font that came from a preschool workbook called, “Letter of the Week.” Using paint and a small toy car, Pookie can learn to make the letters. With paint in a dish, he runs the car through the paint then draws the letter by running the car inside of the bubble letters. In his perception, he is playing with his car. Yet, in the course of the play he is also learning that letter of the alphabet. Using the stacking pegs in a rubber mat strengthens both the fingers and well as the arms. If you doubt that, try for yourself to see just how snug those pegs fit into the mat! It takes effort to push the pegs into the mat as well as when pulling them out. Yet, to him it is a game. Add into the task the number mats which have a child place the number of pegs into the mat to correspond with the numeral on that mat and you have a math game. The pegs become a method of sorting and pattern sequencing depending on how you choose to use them. The whole idea is to take a look at the toys or games in your home. Look at them from a skill development or academic achievement approach. How can you alter the play to gain the most from it? Any child’s toy can be turned into a tool for teaching. Sometimes it may require that you think outside of the box. Your limits are only in your creativity. We had a major change in our household this week. My eldest daughter’s family, who had been living with us for the past 7 months, moved to another town to be closer to her husband’s new job. They had moved in with us last September after a job loss. Now, I am looking at a very empty looking front room that they had used as a bedroom. I am turning that room back into the homeschool room as it had been before. We have always liked the idea of having a separate area just for the homeschooling. The front room, with all of its natural lighting is perfect for that. After a quick trip into town to return a library book, it is on to the task of making that room a place for homeschool and therapy again. I have so many ideas on how to do the homeschooling area. I want it to be very efficient for both the kids and myself. Little Miss lives to be as independent as possible in her schooling. She really enjoys that part of the workbox system. We had let the workbox system sort of fizzle out while my older daughter’s family lived with us. Now, Little Miss is wanting it back. Frankly, I enjoyed it too. It means a little bit more work for me to get the workboxes filled each night, but it is worth it the next day. As she works on her independent work, I can focus more fully on Pookie’s TEACCH sessions. At the homeschool convention, I bought My Father’s World’s Toddler package. Might seem an odd purchase for a 4 yr old, but the activities in that package work great for building up Pookie’s hand strength and his fine motor skills. He already gets a lot of gross motor exercise just through his daily play and being outdoors. While my grandsons were living here, I saw that Pookie’s fine motor skills stopped developing at about 6-8 months of age. He never naturally developed the pincer movement, for example, which is necessary to learn to feed himself finger foods. Watching my young grandson grow and develop, I was able to see the benchmarks clearly that Pookie never reached. The toddler package has puzzles and other simple activities that will address those issues. One activity is the tall stacking pegs with a rubber mat. He has 2 sets of these pegs. One has a square mat while the other is a train comprised of 5 mats. The train engine has 1 spot for a peg and the numeral “1”, the remaining cars & caboose have the numbers 2-5 on them. Through this activity, he will get the fine motor development while learning his numbers 1-5. All of the activities in the package, added to what I already have for him, will provide him a multi-sensory approach to his learning as well as being a valuable therapy for his hands. The good part is that he enjoys these types of activities. Little Miss enjoys having the morning calendar notebook to do each day. I am making a nice morning calendar board for her and Pookie. Of course, at this point he is not doing a notebook yet, but he can sure listen to us go through it! I am finding that he learns more than people imagine just from listening. I also want him to get into the routine of the morning calendar. Over the summer, as Little Miss goes through her current curriculum, we will be working much more intensely with using visual schedules. Not only for her but especially for Pookie. Now that we have more wall space to display the schedule, I will be focusing more on that over the next few months. Doing workboxes with Little Miss is so vastly different than with Pookie. She loves having the workbox number tags that are of a theme, such as a favorite character or pretty scrapbook paper. It makes the workboxes “pretty” to her and she enjoys it. Pookie, however, needs his tags to be more plain and utilitarian at this point. If I were to make him some with a colorful graphic or paper, the colors & design would be very distracting to him. For Pookie, his tags are very simple. Using scraps of solid color cardstock which I laminated, I cut out 1.5″ squares. I cut 2 of each color. One set is placed on his task trays and the other on his schedule. He matches them up just as Little Miss would do her numbers. Using colors instead of numbers is just a much more simplified method. Later on, I can add numbers to the tags. Until then, he is still learning the process which will in turn help him learn independence in completing his tasks. Today we went to the homeschool convention in Tulsa. Little Miss got quite a fun treat. 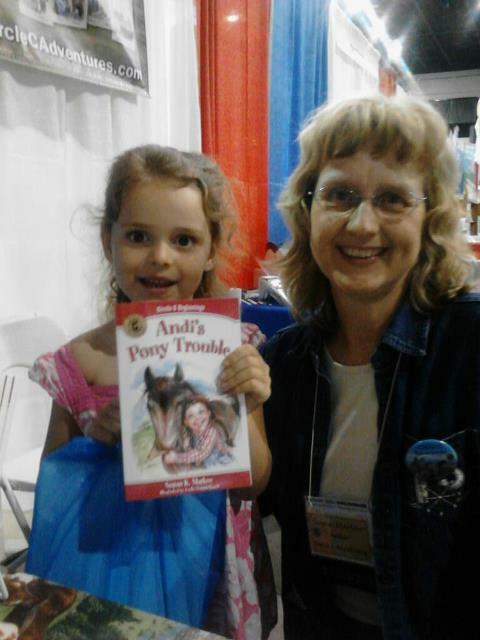 She got to meet, Susan K. Marlow, the author of the Circle C Adventures book series. Mrs. Marlow was very sweet with Little Miss and autographed a book for her as well as allowing us to take a picture of her with Little Miss. This book series is set in the 1880’s. On the website, there are activity & coloring pages to go with each book. At the convention, they also had lapbooks available for purchase along with paper dolls. Overall, the books and additional resources are perfect for homeschooling or simply extending the love of reading. It was a fun time for Little Miss. She is already talking about wanting the book read to her tonight. I am certain we will be ordering more of the books in the series very soon!